A small cabin, 16' square. This lovely little cabin is at the end of a road, quiet, surrounded by beautiful woods! There is a kitchenette; sink, frig, stove top. Coffee maker, microwave and toaster. Also a sofa, table and chairs. There is a set of bunks, both double size. It will sleep 2-4 people. A play-n-pak is available if needed. There is a full bath. Also, there is a nice HOT TUB, a freezer and a grill! We live out here, in the house we built next door. Raised our four daughters in a basement while we built a log home and have always loved the end-of-the-road, the beauty and peacefulness here and thought perhaps others might also. We are in the center of kenai peninsula, which is a wonderful area to explore!! Very nice cabin at the end of the road in the woods. Clean and well kept. Seeing cow moose and calves was a bonus. So glad you all came, thanks so very much!! Glad you got some fishies and the moose came by 😋� Have a great winter!! 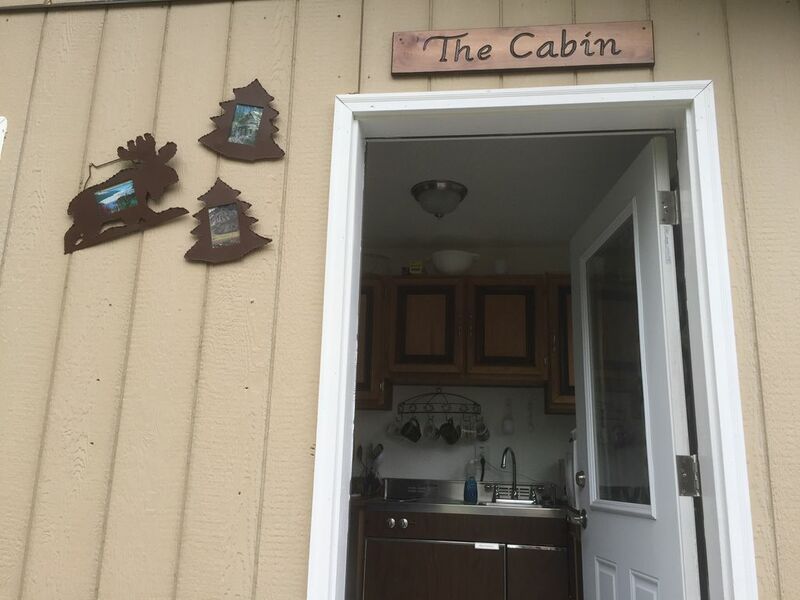 A very comfortable cabin in a very serene environment but also close to Soldotna on the Kenai Peninsula. I hope to stay there again next year. Spent a week in this cabin near Soldotna. It was clean, comfortable and perfect for our 2 man fishing trip. So much better than staying in a hotel. We will definitely be booking this place again. Highly recommend! I mean we weren’t expecting a stocked fridge and a pack of English muffins. They didn’t have to do all that nice stuff for their seasonal renters but they did and YAAS! Loved seeing the moose and chillin in the hot tub! Thanks!! Soooo glad you came and that everything was good there!! Thank you so much for hanging at our place and hope to see you again! Quiet! Cozy! Had everything you need. Has toaster, stove, pots, pans and dishes. Has hair dryer, shampoo, conditioner and soap. Just bring some food and you are set. The owners are charming and friendly. Thank Odie!! You are welcome, Thank you so much for coming, hope you had a restful day! I'm so glad you enjoyed the cabin. Sorry I missed you leaving , early???!!! Glad to meet you both, thanks again! Just right for a couple or small family. Property is convenient to town but is very quiet. Well appointed with everything I needed or wanted. Thank you so much, Dan!! The water has been a challenge. Had the same thing in house and we put this one in new so experimented ourselves. We tried your method. I also found that If I turned it all the way, waited then tweeked it gently back , it seemed to hold. Thanks for the feedback. Glad you had a good time , hope you got fish and had a special time with your dad!!! summer fishing, sightseeing. kenai peninsula has mountains, lakes, beaches, trail; boat and plane tours. hunting in season. hiking, riverboat trips. beauty everywhere!